I've visited the Rubin house numerous times during the past nine or ten years. 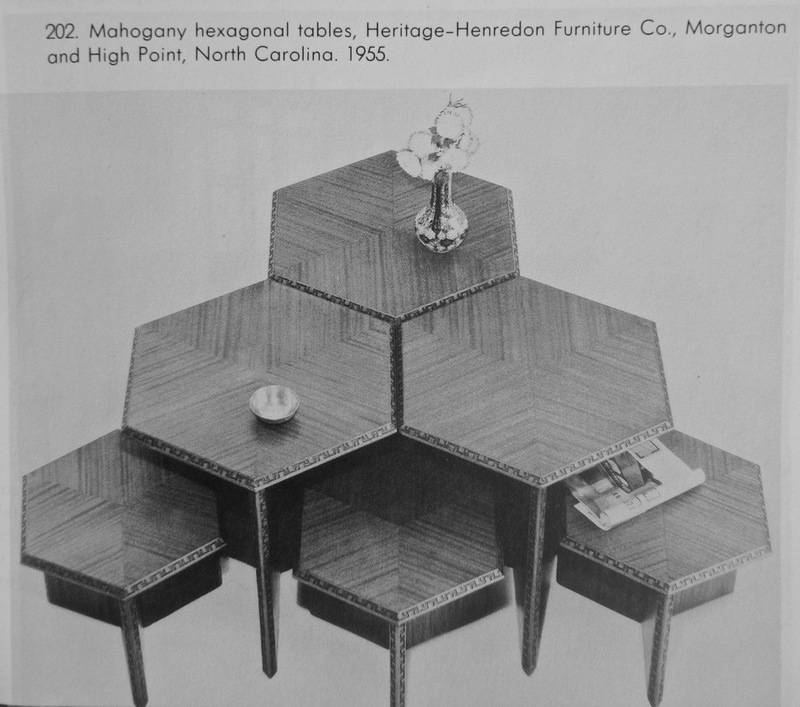 Although I did not turn the pieces over, to examine construction or looked for a Logo, I can remember Jeanne informing me that the Hexagonal table and six triangle stools or small tables were Heritage-Henredon pieces. They were in excellent condition, as I can recall, with ribbon striped Mahogany book matched veneers. I will try to examine them this up-coming week and report back. Had time to inspect the table and stools at the Rubin. They are not pieces produced by Heritage-Henredon. As for who produced them- It most likely was one of the carpenters who constructed the original loose and built-in pieces. (Bob Rubin, son of Jeanne and Nate can always remember the table and stools in use) The color, the grain, the texture of the mahogany, and the patina all appear and feel like other pieces in the house. Now that these Canton homes are 55 years old this furniture and their houses are semi-antiques and on their way to becoming true antiques. It is hard to believe that Wright's last body of work is on its way to the classification of "Antique". The joints are dead on, with solid wood edging/fascia. The under-structure is 6/4 plywood with solid edging (two 3/4 thickness laminated together, which facilitated the central core joint). Also we can not forget that Mr. Nate Rubin was a woodworker, he asked and received a woodworking shop designed by Wright, it is possible that he was involved in its making. Pictures are one thing but I must say the pieces are really wonderful in the flesh. The stools are very comfortable for their short seat height (even for an adult, I'm 6ft 1 inch tall.) and we must remember that numerous small children, grand and great grand children had their meals at this very table during various Rubin family events. Thanks so much for that report, dtc. I'll look for some relevant photos that illustrate what you describe. custom pieces. Could they have been made by Mr Rubin -- is that the assumption, now ? Again, thanks for the good words. We can feel that much closer to "the source," now. . . I was aware that Mr. Rubin was involved with some of the furniture, but also had help from professionals as well. He worked on a maquette for the upholstered plywood chair (which is now known as the Origami) before commissioning it to a cabinet maker. If Dr. Nathan Rubin made the table he was a multi-talented individual indeed, practicing medicine by day-woodworker by night. My hat goes off to him, and of course to dear Jeanne as well. It is so nice to follow some of these threads over time and thank you Mr Minnich for supplying the missing link from our conjecture. I was wondering who supplied the prototypes for the HH designs and now some of the actual pieces and the maker have been identified. Wonderful work! I saw this original catalog on Ebay. In case any of us is interested, two pairs of Heritage Henredon triangular stools are for sale at a fixed "buy it now" price of $875 for each pair at the Toomey & Co auction house. The stools were lots that did not sell at a recent sale (sale 114) Lots 297 and 298. Any idea what the highest bid was? None. I was not following bidding for this auction. The auction catalog typically lists a range of what the auction house and seller expect/hope the lot will sell for; the price reached must have been below that range or minimum reserve. The original range is no longer available online and I don’t recall what it was...a print catalog would have that. As of the time of this post, one pair of stools has sold. 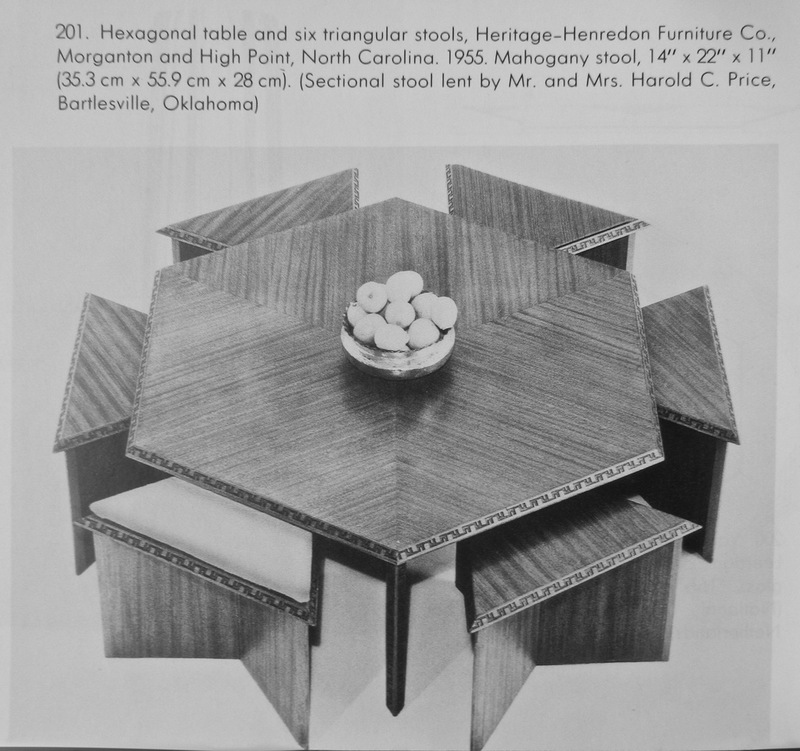 I was watching this sale and looked up a past auction in which a table and 6 triangle stools went for just over $3000 which I consider a bargain. I'd never seen the "stools" referred to as stools before and always thought they were smart pull-out tables that could be arranged more conveniently for a larger group. Were people really intended to sit on these stools and eat at the larger table? Seems impractical. But this remains my fav HH design of Wright's.